The Baths of Trajan (Trajan or Latin Thermae Thermae Traianae) were the baths of ancient Rome, erected a few years by the fire of the Domus Aurea (104 AD) and ended in 109 AD by Trajan, with inauguration on June 22. 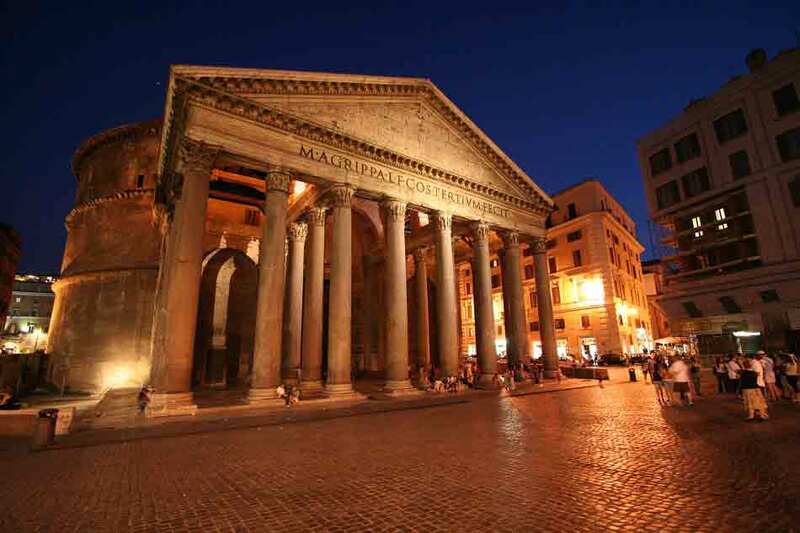 Although chronologically preceded the Baths of Agrippa and those of Nero and Titus, were the first "big baths" in Rome and at the time it was the largest spa building in the world. 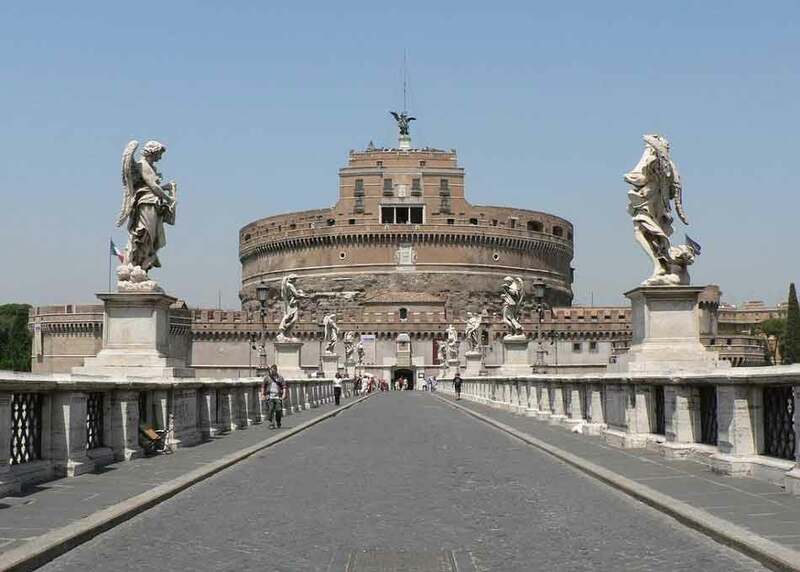 As celebrated by the Fasti of Ostia was in fact in 109 AD, during the reign of Trajan, which was completed the construction of this impressive facility. The work is attributed to the architect Apollodorus of Damascus, Syria (the author of the Forum of Trajan), and since its inauguration began to talk of building spa style "imperial". With an area of ​​about 60,000 square meters, the Baths represented the first example of monumental spa complex open to the public and made ​​innovative for that time, also accessible to women. His project, in addition to the incredible variety of rooms for the bathrooms, foresaw a series of measures really futuristic for its time: the presence of large green areas dedicated to gathering places and recreation for all social classes, libraries and gyms care of mind and body, and an orientation of the structure that maximizes the one hand the amount of heat and light during the day, and reduce exposure to the winds. In fact, the criterion was revolutionized North-South orientation, hitherto undisputed, emphasizing that laid along the North-East / South-West. Finally, the inauguration of the mirror-image provision of environments from the central axis. From that moment, the subsequent thermal baths of Rome, including the Baths of Caracalla, Diocletian and Decius, were all made according to these criteria. The area on which the baths were built was partly the one on which they were previously built other masterpieces memorable era, such as the pavilion "Esquilino" of the Domus Aurea (destroyed by fire in 104 AD) and the structure in which it was found spectacular fresco called "painted City". For the rest, other rooms were built specially for the purpose of connecting the various parts of the complex and rooms used to accommodate changing rooms (apodyteria), baths and saunas and massage rooms. From the Forma Urbis Severiana, the marble plan dating from the third century AD, and remains currently present within the Park of Opium Hill, you can get a plausible reconstruction of the plan, by exploiting the Renaissance drawings and preserved a certain resemblance to other large thermal complexes (among all Caracalla). Access to Spa could be from different points. The monumental entrance located North -East looked directly into the room dedicated to the bathrooms. Continuing along the same direction, they met in the sequence pool of cold water (natatio), frigidarium and finally the rooms dedicated to the warm bath (tepidarium) and heat (steam bath). On this side there were dressing rooms and gyms. The actual remains of the Baths are few but impressive: an exedra, that of the gym located to the east, the apse of the mail room on the south side and the area of the Sette Sale, the name by which they are known the huge containers that ensured the supply of water for the baths. Thanks to the epigraphs found, it was possible to identify some of the many works of art which were to decorate the rooms of the Spa. Among these, the statue of Laocoon currently preserved in the Vatican Museums, a large granite basin now located inside the Cortile del Belvedere and an altar dedicated to Jupiter. It is indisputable as the Baths of Trajan still represent fascinating and evocative. Visiting them, driving along a route through an environment ideal always been associated with relaxation and well-being. A structure already then crucial from the point of view of the role and the social importance that covered and which would be incredibly current also nowadays. The construction of the Baths of Trajan was performed by acting on an urban area of ​​over six acres, certainly occupied by the previous construction: for example, from the pavilion esquilino the Domus Aurea, the Baths of Titus and other structures found in the South- West of spas. These buildings are all characterized by a north-south orientation. The presence of the Domus Aurea indicates that the area was for the most part already imperial property and this would facilitate the construction of a complex as vast as the Baths of Trajan in a central and prestigious area of ​​Rome. Following a major fire, dating from around 104 AD, which struck the famous residence of Nero, Apollodorus demolished all that remained of the upper floors of the complex, leaving only the locals on the ground floor which he used as a base for future baths. At the same time ordered the demolition and burial of several adjacent buildings in order to obtain a large area on which to build the facility spa. Just these operations and demolition landfill sealed and safeguarded a good part of the Domus Aurea and the neighborhood pre Trajan. The Baths of Trajan are arranged on a northeast-southwest axis and are rotated by 36 ° from the orientation North / South existing building, to maximize the light and solar heat, ensuring the maximum caldarium radiation between noon and sunset. 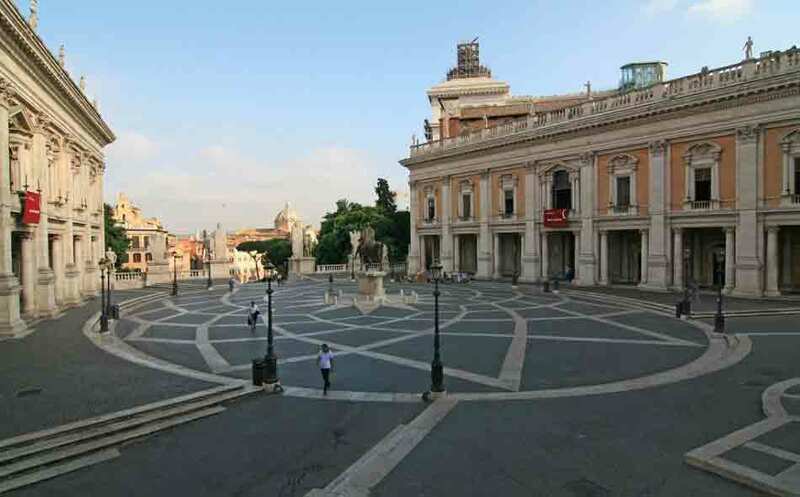 The disposition toward the cardinal points, their pre-existing building, re-emerges, however, in some places, as in the cistern of the so-called "Sette Sale". The Baths of Trajan belong to the so-called "Great Imperial Type". The spa facility was composed of two main parts: the buildings of the fence and the central body. The enclosure (330 x 315 m), probably an invention of the architect Apollodorus, delimiting the platform on which was built the complex: it was rectangular, porch on three sides, with rooms designed for social and cultural activities, and enclosed in its inside a large green area discovery, identified with a large gym (xystus or palaestra). The fence ended with an imposing portico at the center of the South- west, above the ruins of the Domus Aurea. Inside it was provided in the form of steps of a theater and it may serve to assist the gymnastic competitions that were held in xystus. The monumental entrance to the spa was in the middle of the northern side and opened with a sort of propylaeum. Other entrance to the building were located in the enclosure and consisted of scales, necessary to overcome the difference between the plane of the surrounding neighborhood and that of the new building. Among the remains relevant to the fence, visible in the Park of Opium Hill, there is a bi- hall with an apse on the north side of the complex, oriented as the Domus Aurea. Other exedra smaller, however, opened in the perimeter: two of these were placed in the corners northern. Each of them consisted of two semi-circular and concentric structures. Their function is still uncertain. The exedra North East is the best preserved: traditionally been interpreted as a nymph with fountains, it presents eleven niches along the wall alternately rectangular and semicircular, and is covered by a half dome decorated coffered octagonal and triangular. The presence of steep slopes in the morphology of Opium Hill necessitated the construction of a terrace on the other three sides of the fence, above which the baths were built. This system of substructure is due a series of cells or caves, now partly visible on the South- west of the complex. Two other esedre opened in the corners of the south side: they were built by a semicircular structure placed within another rectangular in shape. 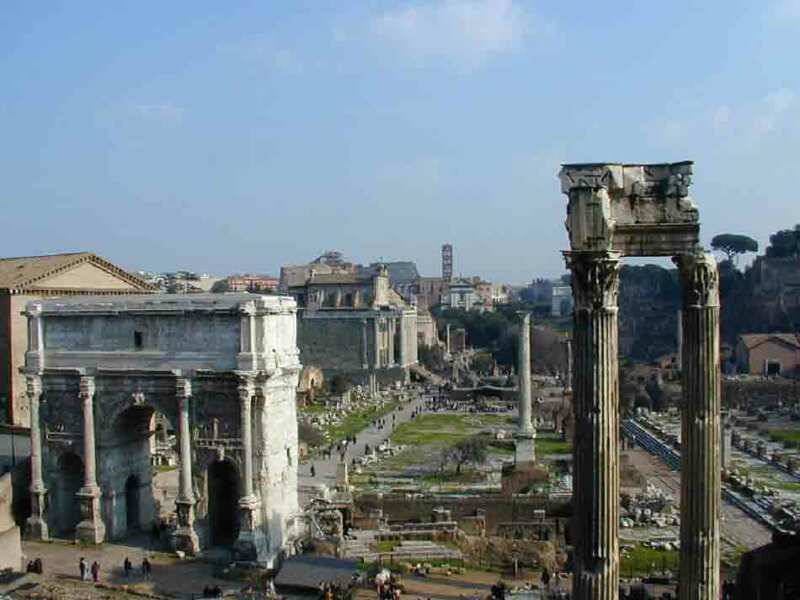 The exedra South- West is the best preserved and is interpreted as a large library: the semicircular exedra, in fact, is characterized by the presence of a double row of large rectangular niches, labeled containers of cabinets to store books and documents. Between the two rows of recesses are visible deep business for the support of a wooden gallery. In environments of triangular shape, formed in the space between the quadrangular structure and the chamber of the exedra, there were the stairwells, perhaps exclusively reserved for the staff of the baths, by means of which access was gained to the gallery at the second order niches and the upper floors of the rooms on the sides of the building. The exedra was covered by a half-dome, now preserved to a height of 4 m, and was decorated with coffered trapezoid. The reproductions of Giovanni Battista Piranesi we see that the trapezoidal boxes alternated with larger ones of hexagonal shape. A few remnants remain, however, of the other semicircular South- Eastern Europe, on the opposite corner of the fence, still partially visible at the time of Piranesi. An analysis of the external enclosure of the complex can be deduced that when viewed from outside, did not constitute an architectural plan: the external profile, in fact, was determined mainly by the need to place the spa on a pre-existing district. The interest of the architect, however, was all facing the inside of the complex. The central building (approximately 190 x 212 m) was presented as a closed rectangular block, the perimeter of which protruded only the body of the steam bath. The central building was placed at the center of the fence and maybe it was leaning against the north side, where there was the main entrance. After the entrance, classrooms springs were arranged in sequence along the central axis: the natatio, frigidarium, tepidarium and finally the caldarium. Around this axis were distributed symmetrically all other environments, such as changing rooms and gyms. Unfortunately all central building was destroyed and only a few structures remain: the exedra of one of the environments interpreted as gym, the apse of the south side of the classroom, and part of the wall of the frigidarium, reused in a hunting lodge of the Brancaccio and now the Senior Center. These three structures, very close together, are visible at the center of the Park of Opium Hill. The exedra of the gym keeps part of the eastern half-dome coffered square and the wall is punctuated by a series of semicircular and rectangular niches. In the context of the ancient baths have been found several mosaics and frescoes mainly from underground buildings, prior to the construction of the spa: the fresco of the "Painted City", the "mosaic of the Harvest" and the prestigious and rare wall mosaic depicting Apollo and the Muse, found a length of about 16 m in the recent excavations of the Superintendence of Cultural Heritage Capital of Rome. As a result of recent studies seem to exclude, however, the origin of this complex group of Laocoon, now in the Vatican Museums, which seems to come from the neighboring Horti Maecenatis. By Pausanias and Dio Cassius we know that the baths were designed for the emperor Trajan (98-117 AD) by the architect Apollodorus of Damascus, engaged in the same years in the Forum of Trajan and Trajan's Market. Some late Roman and early medieval sources, however, attribute a large part of the construction of the spa to Domitian (81-96 AD), dating to the age of Trajan, however, is confirmed by the numerous brick stamps found on several occasions in the area. From the ancient literary sources there comes the news that the baths were still in use in the fourth or fifth century AD, when they were adorned with statues from prefectus Urbis Happy Campanian. Traditionally it is believed that the complex has lost its thermal function after cutting the aqueducts carried out in 537 AD by Vitiges, king of the Goths, to force Roma to surrender. However, recent archaeological excavations seem to anticipate the event to the fifth century AD for the discovery of a necropolis within the spa complex, in the space in front of the north-eastern exedra. The tombs found near the hemicycle seem abandoned around the seventh century AD During the Middle Ages the Opium Hill was rejected on the edge of the town and occupied by vineyards and orchards, which preserved a large part of the spa building from overlapping. In 1871, as part of the new programming planning necessitated by the changing needs of Roma Capitale, the area was used as a public garden, while most of the top of Opium Hill was bought by Brancaccio. Between 1935-36 A. Munoz, Director of Antiquities and Fine Arts of the Governorate of Rome, having expropriated the property to Brancaccio, intervened in the area of ​​Opium Hill for the creation of an archaeological park, created by changing the slope of the rise, particularly with the construction of the avenue of Mount Opium. 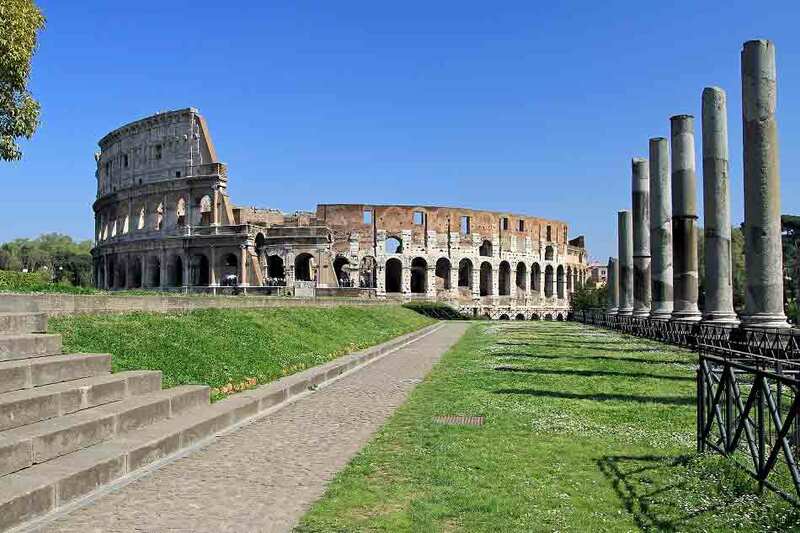 The new road was conceived as an avenue which has panoramic backdrop to the Coliseum and the function of connecting the valley of the amphitheater with Merulana, but it crosses the Baths of Trajan, preventing a unified understanding. In 2011 it was discovered a mosaic in the Baths of Trajan. A new Apollo emerges from the bowels of the hill. 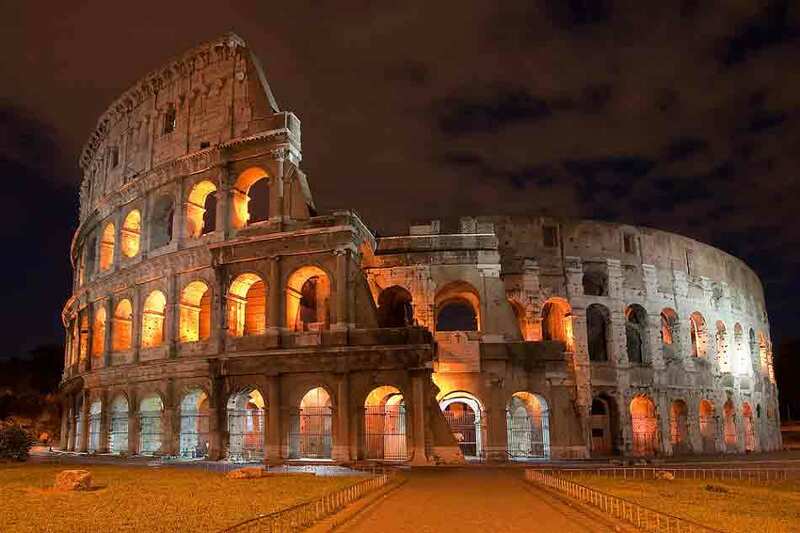 An exceptional discovery a few steps away from the Domus Aurea, the Coliseum and from the archaeological center. A large mosaic. The artifact has resurfaced not far from the fresco of the "Painted City", which had been found in cryptoporticus Trajan in February 1998. The area is still one of the tunnel Trajan, the mosaic has at its center the figures of Apollo and the Muses. And Apollo was the god depicted in the spotlight with a statue in the fresco of the ideal city big ten square meters. We are under the large exedra of the spa complex designed to Trajan in 109 of the Christian era by the brilliant architect Apollodorus of Damascus, the new discovery is most likely a previous building the plant Trajan. There are still other ten meters to dig deep. This is all part of a building of the Flavian same age of the Domus Aurea. The floor dates back to the base 60 of the Common Era. Above the cryptoporticus and the mosaic are the Baths of Trajan inaugurated in 109. The cryptoporticus that in the modern age had hosted a powder keg Napoleon is the subject of successful investigations in the second half of the 90s. It was there, in fact, in February 1998, that the end of the long gallery of sixty meters (large eight) was brought to light the famous fresco bird's eye view of a city that was soon called "Painted City" and that according to the imaginative art critic Federico Zeri rushed to see it could have been even the ancient Londinium (London). The fresco winded the first who saw it, the archaeologist Elizabeth Carnabuci: the representation of a city, with its circle of turreted walls, displayed on the left of the blue a river spanned by a bridge and with external walkways. At the bottom of a mausoleum golden tones and a row of red houses, near a four-sided colonnade and on the right edge of a temple and other buildings on a hill. At the center of the city finally a golden statue of colossal dimensions placed at the intersection of two streets. And again, a theater, next to which soar here a statue of Apollo on a high base. The same god depicted in the subject of the mosaic just discovered, following six years of the discovery of another large floor tiles.